WASHINGTON, March 31, 2011 — They served their coun­try in uni­form -– many on the front lines in Iraq and Afghanistan. And now that they’ve returned home and rejoined civil­ian life, an alarm­ing num­ber of vet­er­ans have found them­selves on the streets and liv­ing under bridges. The Vet­er­ans Affairs Depart­ment is mak­ing progress on its com­mit­ment to end home­less­ness among vet­er­ans, Deputy VA Sec­re­tary W. Scott Gould told Amer­i­can Forces Press Ser­vice, striv­ing to achieve that goal ahead of its orig­i­nal 2015 timetable. 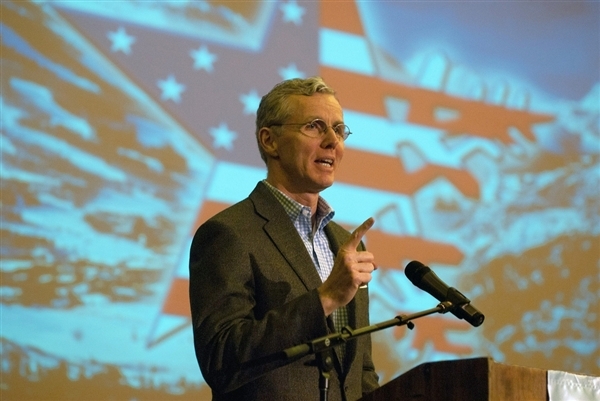 Deputy Vet­er­ans Affairs Sec­re­tary W. Scott Gould speaks at open­ing cer­e­monies for the 25th Nation­al Dis­abled Vet­er­ans Win­ter Sports Clin­ic in Snow­mass Vil­lage, Colo., March 27, 2011. Gould said VA is mak­ing sol­id progress on its pledge to elim­i­nate vet­er­an home­less­ness by 2015. “This is a big, bold goal,” Gould said of the pledge Pres­i­dent Barack Oba­ma and VA Sec­re­tary Eric K. Shin­se­ki announced in 2009. “What I see there is the pres­i­dent and sec­re­tary will­ing to do some­thing that rarely hap­pens in gov­ern­ment, which is to set a clear, mea­sur­able and time-phased goal — zero home­less­ness by 2015 for our vet­er­ans — and then apply the resources, the plan­ning and the lead­er­ship to make that hap­pen,” Gould said. Shin­se­ki has become even more for­ward-lean­ing on the issue, vow­ing to achieve those aims a year ahead of sched­ule. Also last month, Shin­se­ki told the Dis­abled Amer­i­can Vet­er­ans that major progress has been made. The num­ber of home­less vet­er­ans has dropped from about 195,000 six years ago to about 76,000, he report­ed. VA is work­ing to bring that fig­ure below 59,000 by the end of June 2012, and ulti­mate­ly, to zero. VA’s fis­cal 2012 bud­get request includes $939 mil­lion – up more than $140 mil­lion from last year — for pro­grams to sup­port this mis­sion and build on progress made. A com­pre­hen­sive review is under way to iden­ti­fy vacant or under­used build­ings in VA’s inven­to­ry that could house home­less and at-risk vet­er­ans and their fam­i­lies, Shin­se­ki told the Sen­ate Vet­er­ans Affairs Com­mit­tee ear­li­er this month. So far, VA has iden­ti­fied 94 sites that, once ren­o­vat­ed with funds allo­cat­ed by Con­gress, could add anoth­er 6,300 hous­ing units through pub­lic-pri­vate ven­tures using VA’s enhanced-use lease author­i­ty, he report­ed. With this author­i­ty sched­uled to lapse Dec. 31, Shin­se­ki has urged Con­gress to pro­vide the reau­tho­riza­tion need­ed for VA to con­tin­ue increas­ing hous­ing for home­less vet­er­ans and their fam­i­lies. Mean­while, the most flex­i­ble and respon­sive option remains the Depart­ment of Hous­ing and Urban Devel­op­ment-Vet­er­ans Affairs Sup­port­ive Hous­ing vouch­er pro­gram, Shin­se­ki said. The pro­gram com­bines Hous­ing Voice Vouch­er rental assis­tance for home­less vet­er­ans with case man­age­ment and clin­i­cal ser­vices by VA.
Shin­se­ki said it’s the only option cur­rent­ly avail­able to pro­vide hous­ing for home­less vet­er­ans with fam­i­lies. Gould, attend­ing the 25th Nation­al Dis­abled Vet­er­ans Win­ter Sports Clin­ic in Snow­mass Vil­lage, Colo., ear­li­er this week, rec­og­nized that home­less­ness is more than a hous­ing issue and typ­i­cal­ly stems from health and men­tal-health prob­lems. “Home­less­ness is real­ly a symp­tom and the end step in a long stage of dete­ri­o­ra­tion,” he said, cit­ing issues rang­ing from job loss or eco­nom­ic duress to lack of access to health care, rela­tion­ship prob­lems or chem­i­cal depen­dence. “So we have invest­ed a lot in improv­ing access to the health care that pre­vents home­less­ness,” Gould said. He cit­ed growth in VA’s Vet­er­ans Health Admin­is­tra­tion bud­get to pro­vide more proac­tive, pre­ven­tive men­tal health and psy­cho­log­i­cal coun­sel­ing, as well as oth­er health care. This care helps vet­er­ans tack­le prob­lems at their root and intro­duces them to the broad array of pro­grams in place to help in pre­vent­ing them from slip­ping into home­less­ness, he said. “Once they are [at VA], we have the tools and capa­bil­i­ties to be able to help them,” he said. Gould per­son­al­ly has wit­nessed the home­less­ness prob­lem. On a cold, win­tery night in late Jan­u­ary, he joined Hous­ing and Urban Devel­op­ment Sec­re­tary Shaun Dono­van and Inter­a­gency Coun­cil on Home­less­ness Direc­tor Bar­bara Poppe, walk­ing the down­town streets of the nation’s cap­i­tal as part of a nation­al count of home­less per­sons and fam­i­lies. “It was a strik­ing expe­ri­ence,” Gould said of his oppor­tu­ni­ty to meet per­son­al­ly with home­less vet­er­ans dur­ing HUD’s nation­al “Let’s Make Every­body Count!” cam­paign. Defense lead­ers have joined VA and the pres­i­dent in call­ing vet­er­an home­less­ness a scourge on Amer­i­ca that must be addressed. Navy Adm. Mike Mullen, chair­man of the Joint Chiefs of Staff, has been par­tic­u­lar­ly out­spo­ken on the issue, con­cerned that a new gen­er­a­tion of com­bat vet­er­ans is slip­ping into the same sit­u­a­tion plagu­ing too many of his Viet­nam-era con­tem­po­raries. Mullen said he’s trou­bled by the num­ber of home­less vet­er­ans of Iraq and Afghanistan he has met dur­ing his vis­its to Vet­er­ans Affairs hos­pi­tals. Work­ing with their fed­er­al, state and local part­ners in both the pub­lic and pri­vate sec­tors, Gould said VA is com­mit­ted to pro­vid­ing vet­er­ans exact­ly that.